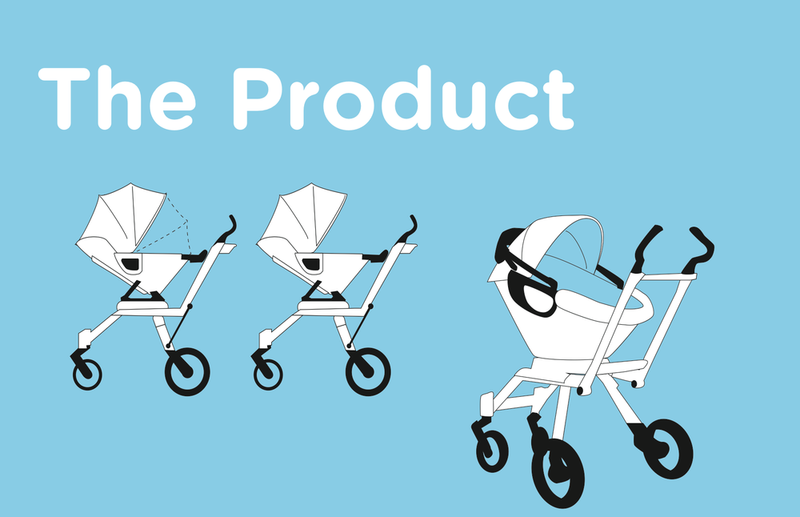 Pouch is a stroller built using Panasonic's cutting edge technology designed to shield a child from environmental hazards. Pouch is a marriage of the heart and soul of FisherPrice, and the engineering and technology of Panasonic. In the event that it senses harmful airborne pollutants such as carbon monoxide, smog, phthalates, influenza, or bacteria, Pouch will deploy a HEPA filtration net that will protect the child from infection. According to a study by UCLA, "early childhood is also a critical period for the continued development and maturation of several biological systems such as the brain, lung, and immune system and air toxics can impair lung function and neurodevelopment, or exacerbate existing conditions, such as asthma." The Canopy is the store extension of the Pouch brand, where not only the strollers are being sold, but clothing and all sorts of baby safety kits as well as little stuffed toys based on cartoon characters in the brand. Everything is made to be hypoallergenic and BPA free as well and that would be a keyfeature of the store. Like the separation of "health food" stores from their regular grocery counterparts, this could be a "clean product" baby store. 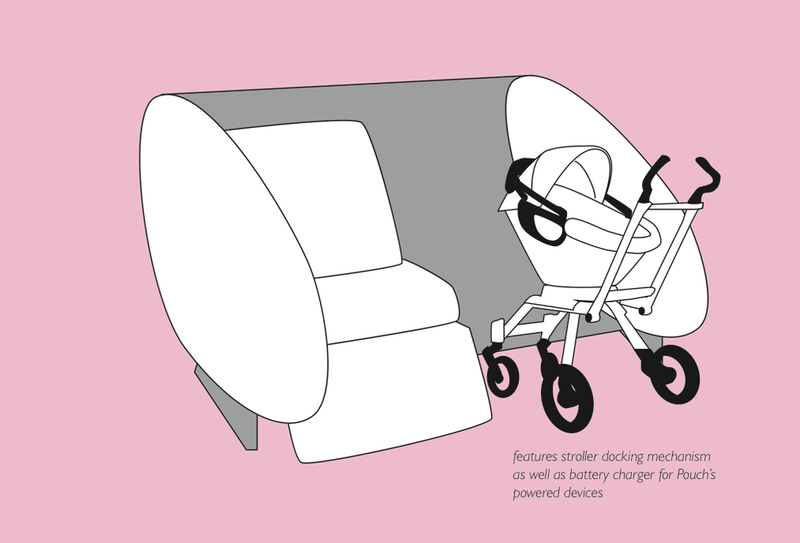 PouchPod is a large seating and resting device made for tired airport parents.It features a stroller docking mechanism that has a battery charger for all of Pouch's powered devices. 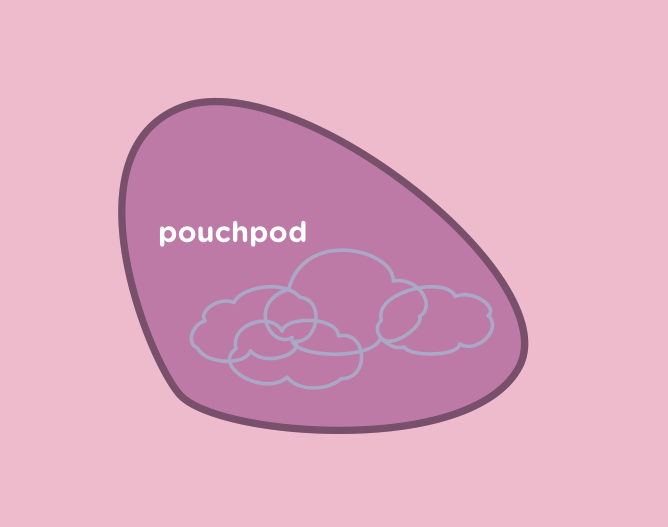 PouchPod also deploys a modesty cover for mothers who need to breastfeed in private. The Pouch website explains the product in detail, as well as educates its audience about the danger of airborne pollutants. It also offers realtime updates on local air quality. The Pouch brand also includes a mobile app called RooRoo that uses existing sensors, microphones and cameras that sit inside of Pouch to act as an advanced baby monitor system. That way, the parent can view their child's vitals via their smartphone. RooRoo also keeps a log of the noise activity i nside Pouch, so that the parent may know how their baby has been sleeping the past few hours. Most of the public do not understand the hazards of smog and particle pollution. A logical place to have the majority of the campaign occupy bus graphics, as public transportation travels through a while range of urban and suburban locations. This graphics also feature sensors and lights that show riders the current air quality on location.